Mid September in the southern Appalachian mountains is typically a warm, sunny time of year. So warm and sunny that the night before this wedding I thought it would be a good idea to go camping... and woke up to 37 degrees the next morning. 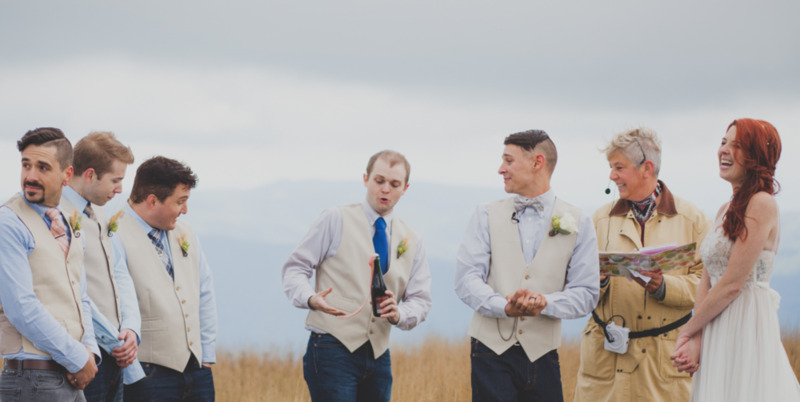 Needless to say the rest of the day was cold and windy, but this wedding on top of Big Bald Mountain was stunning. When we hiked to the top there was about 3 feet visibility, then Holly started her ascent and the fog cleared immediately. Serendipitously. Should I ever get married I hope it's something a bit like this. 20 close friends, lots of happy tears, and a toast with good beer to conclude the ceremony. "We have a Gueuze Kriek here made by the brewery Oude Beersel, bottled in 2012, the year we met and began our courtship. As time passes, like a good marriage, it will get better and better, becoming smooth and complex at the same time, and satisfying no matter what comes." Cheers to Holly and Matt!